Broome Farm01989 562824work Bed & BreakfastBroome Farm is a 300 year old working cider farm offering bed & breakfast in en-suite accommodation. Located in Peterstow, just two miles from Ross-on-Wye in the Wye Valley Area of Outstanding Natural Beauty. The farm is a peaceful location overlooking the beautiful Herefordshire countryside with 55 acres of orchards to wander through. The rooms in the farmhouse itself at Broome Farm are decorated in farmhouse style with antique furniture, pocket sprung beds, T.V. with free to air channels, tea/coffee making facilities with fresh milk, free Wi-Fi. The Orchard Suite has a double en-suite bedroom with dual aspect views, separate lounge with sofa, dining table, T.V./Wi-Fi and a kitchenette with fridge, two electric rings, kettle, toaster, sink with drainer, microwave, kitchen utensils, crockery and cutlery. The Cider Suite has a king-size bed, large luxurious bathroom with double-ended bath, separate shower, infinity mirror, W.C., washbasin, heated towel rail. Lounge area with flat-screen T.V., tea/coffee making facilities and fridge. Broome Farm is a 300 year old working cider farm offering bed & breakfast in en-suite accommodation. 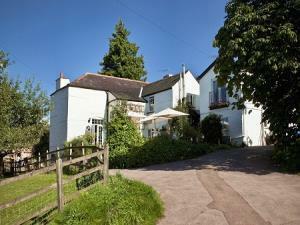 Located in Peterstow, just two miles from Ross-on-Wye in the Wye Valley Area of Outstanding Natural Beauty. The farm is a peaceful location overlooking the beautiful Herefordshire countryside with 55 acres of orchards to wander through. Licenced Children welcome from age 10.